The word Majlis Raja-Raja (Malay for 'Conference of Rulers") in Jawi script of 'diwani' calligraphic art, which can be seen at the main gate of the office of Keeper of the Rulers' Seal. The Conference of Rulers (also Council of Rulers or Durbar, Malay: Majlis Raja-Raja; Jawi: مجليس راج٢) in Malaysia is a council comprising the nine rulers of the Malay states, and the governors or Yang di-Pertua Negeri of the other four states. It was officially established by Article 38 of the Constitution of Malaysia, and is the only such institution in the world, according to the Malaysian National Library. Its main responsibility is the election of the Yang di-Pertuan Agong (King) and his deputy, the Timbalan Yang di-Pertuan Agong, which occurs every five years or when the positions fall vacant (either through death, resignation, or removal from office). Although its position in the process of elective monarchy is unique, the Conference of Rulers also plays a role in amending the Constitution of Malaysia and some other policies, in particular, those Articles which have been "entrenched", namely those pertaining to the status of the rulers, the special privileges of the indigenous Bumiputra (see Article 153 of the Constitution of Malaysia), the status of the Malay language as the national language, and the clause governing the entrenchment of such Articles. First Malay Rulers Durbar held at the Astana Negara in Kuala Kangsar, Perak in 1897. 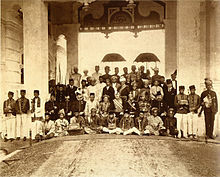 The Conference of Rulers has its origins in the 1897 Durbar, the Council of Rulers for the Federated Malay States, which were not under the British colonial regime, with the British playing the advisory role on only a very few administrative items and the full authority to govern remaining with the Sultan of those states. Only the four Federated Malay States of Perak, Selangor, Negeri Sembilan, and Pahang were represented at the Durbar, which first convened in 1897. The purpose of the Durbar, as described by Resident-General Frank Swettenham, was to "bring home to the Malays, in the most striking manner possible, the reality of federation". After World War II, a similar body called the Council of Sultans was constituted under the short-lived Malayan Union. The Council comprised the Governor of the Union, who acted as President, the nine rulers, and the Chief Secretary, Attorney-General and Financial Secretary as ex officio members. The sole functions of the Council were to consider legislation related to Islam (a function carried out by a subcommittee of the Council, comprising only the Muslim members) and to advise the Governor of the Union or the ruler of any state as necessary. The first Conference of Rulers was convened on 31 August 1948, the year the British established the semi-autonomous Federation of Malaya, where it was attended by the rulers of all nine Malay states. The Conference of Rulers continued after independence, when it was formally established under the Constitution. The membership of the Conference depends on the succession of the Malay sultans, and the appointment of the governors. The Yang di-Pertuan Agong appoints the governors, while each state has its own procedure for succession to the throne. One, Negeri Sembilan, is itself an elective monarchy. Only the rulers of the Malay states of Negeri Sembilan, Selangor, Perlis, Terengganu, Kedah, Kelantan, Pahang, Johor, and Perak are permitted to participate in the election of the Yang di-Pertuan Agong and stand as candidates. The governors of the other states (Penang, Malacca, Sabah, and Sarawak) do not participate when the Conference of Rulers meets to decide matters related to the election or removal of the Yang di-Pertuan Agong or his deputy, those related to privileges of the Malay rulers and those related to the observance of Islam. Should a member of the Conference be unable to attend a meeting, his or her state must designate a temporary replacement; this process is set out by each state's own constitution, and therefore varies. Once elected, the Yang di-Pertuan Agong delegates his state representation in the Conference to the Regent he has selected to rule in his stead in his home state. The Yang di-Pertuan Agong still attends the meetings of the Conference, though he does so intermittently, usually only when the Conference would be discussing national policy or electing a new Yang di-Pertuan Agong. When attending Conference meetings, each ruler and governor is accompanied by the Menteri Besar (for states with a ruler) or Chief Minister (for states with a governor) of his state. When the Yang di-Pertuan Agong attends, he is accompanied by the Prime Minister. Every meeting of the Conference is chaired by one of the nine Malay rulers, who is appointed rotationally. The National Library has called the Conference of Rulers "the supreme institution in the country", which would mean even Parliament is subordinate to it. However, its role is de facto largely symbolic, as even the election of the Yang di-Pertuan Agong generally follows a fixed order based on the seniority of the Malay rulers at the time of independence in 1957. In policy-making, if the Conference of Rulers is involved, the Yang di-Pertuan Agong is constitutionally required to consult with not only the Prime Minister and the members of the Conference, but also with the Menteri Besar (Chief Ministers) of each state. The Conference's role in amending the Constitution was first set out by the Constitution (Amendment) Act 1971, one of the first pieces of legislation passed by Parliament after the catastrophic May 13 Incident, which saw at least 200 deaths after racial rioting in the federal capital of Kuala Lumpur. The Act named Article 152, 153, and 181, and also Part III of the Constitution as specially protected; any public questioning of these provisions could now be criminalised by Parliament (this was done separately at the same time in amendments to the Sedition Act). The provisions in question covered the social contract (not to be confused with the philosophy of a social contract between the government and the governed), a quid pro quo agreement between the Bumiputra and the non-Bumiputra. In return for the granting of citizenship to the non-Bumiputra, the Bumiputra were guaranteed special rights (or, some insist, Malay supremacy — ketuanan Melayu). The amendments thus effectively "entrenched" the social contract, making the contract alterable only with the agreement of the Conference of Rulers. Some have subsequently described the Conference of Rulers as a symbol of "Malay dominance". The provisions covered were (respectively) those relating to Malay as the national language, the special privileges and rights of the Malays and other indigenous peoples (Bumiputra, constituting more than half the Malaysian population), the status of the Malay rulers, and the provisions for Malaysian citizenship. These restrictions applied to all Malaysians, including members of parliament, over-ruling their Parliamentary immunity. In addition, Article 159(5), which governed amendments to the Constitution, was also amended to require the provisions of the Constitution relating to the "sensitive issues" mentioned earlier be amended only with the consent of the Conference of Rulers. This regulation would also apply to Article 159(5). These changes met with strong opposition from the Democratic Action Party (DAP) and People's Progressive Party (PPP), both of which had called for changes in government policies related to those "sensitive issues" mentioned during their campaigns in the 1969 general election. The changes were criticised as undermining Parliamentary supremacy, and some considered the legislation to insufficiently clarify the bans on discussion; in particular, it was wondered if the ban on discussion applied to Article 159(5) as well. Others, such as The Times of London in the United Kingdom, lambasted the constitutional amendments, stating they would "preserve as immutable the feudal system dominating Malay society" by "giving this archaic body of petty constitutional monarchs incredible blocking power", suggesting that this move was hypocritical in light of Prime Minister Tun Abdul Razak's declaration of "the full realization that important matters must no longer be swept under the carpet..." Nevertheless, despite fierce opposition, the Alliance coalition government passed the constitutional amendments in Parliament without the opposition votes because of its two-thirds Parliamentary majority. The Conference of Rulers generally meets triannually, or three a times a year. Should the Yang di-Pertuan Agong or at least three members of the Conference request it, however, the Keeper of the Rulers' Seal may convene a meeting of the Conference of Rulers. Meetings will also be convened not later than four weeks before the end of the five-year reign of the Yang di-Pertuan Agong, or whenever there is a vacancy in either his seat or that of his deputy. The Conference generally meets at the Istana Negara (National Palace), but meetings may be held at other venues should the members of the Conference consent. Meetings have been held on occasion at various state palaces, a State Assembly, and at hotel resorts. Each Malay ruler generally takes turns chairing each meeting. The agenda is generally outlined and made known to the Rulers prior to the meeting. During the meeting, none of the Malay Rulers take precedence above another and all are considered equal. Even the Yang di-Pertuan Agong has no precedence above the Malay Rulers and serves to represent the federal government. However, a Ruler who has been on the throne for a longer period of time is considered more senior and his advice is widely respected due to the wealth of his experience, but this advice need not necessarily be followed. The Secretary of the Conference is the Keeper of the Rulers' Seal. The Royal Scholarship Fund (Fund) (Malay: Kumpulan Wang Biasiswa Raja-Raja) was established on 31 August 1949 by the 8th Meeting of the Conference of Rulers. In accordance with that, a rule has been made and named the Regulations of the Royal Scholarship Funds. The Trustee Meeting of the Royal Scholarship Fund was changed to the Royal Scholarship Fund and Governors (Malay: Kumpulan Wang Biasiswa Raja-Raja dan Gabenor-Gabenor). On May 12, 1983, an Act of Act 284 was gazetted and named the Higher Education Scholarship Fund of the Yang di-Pertuan Negeri of the States (Malay: Kumpulan Wang Biasiswa Pengajian Tinggi Raja-Raja dan Yang di-Pertua Yang di-Pertuan Negeri). Its control and management are placed under the Keeper of the Rulers' Seal who ais also secretary of the Fund's Board. The Board of this Fund in accordance with section 5 (1) of Act 284 consists of a Chairman and four members appointed by the Conference of Rules between the Menteri Besar and the Chief Minister for a period of two years and eligible for a reappointment. The Chairman shall chair all Board Meetings and meet at least three times a year and at any meeting of the Board, the Chairman and two members shall be quorum. The Keeper of the Rulers' Seal is the secretary of the Board. As of 2016, there are less than 600 recipients of award, fewer than the Tan Sri title, which numbered 886 recipients as of 2015. In 2006, the Public Service Department (PSD) implemented a new programme called the Yang di-Pertuan Agong Scholarship (Malay: Biasiswa Yang di-Pertuan Agong) or the King Scholarship, following the decision of the Prime Minister on 3 November 2004, which was approved by the Conference of Rulers meeting on 16 March 2005. This scholarship is introduced to recognize the exceptional skills of candidates wishing to pursue their postgraduate studies (Master's and PhD), particularly in the field of science and technology, either locally or abroad. ^ a b c Khoo, Boo Teik (1995). Paradoxes of Mahathirism, pp. 104–106. Oxford University Press. ISBN 967-65-3094-8. ^ Wu & Hickling, p. 73. ^ Emery, Fred (8 November 1969). "Malaysia unity call against a background of fear", p. 7. The Times. ^ "News Straits Times Malaysia". ^ "Biasiswa Yang di-Pertuan Agong". Perpustakaan Negara Malaysia (2003). "Role Of The Conference Of Rulers In Constitutional Monarchy System In Malaysia". Retrieved 25 August 2006. This page was last edited on 7 April 2019, at 19:29 (UTC).